Conrad Koch- Comedy Ventriloquist. Conrad Koch, corporate comedian. Conrad Koch combines hilarious comedy with world class puppetry. 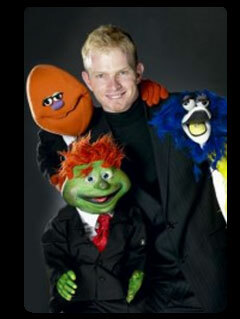 Conrad Koch is undoubtedly South Africa's favourite comedy ventriloquist. Conrad Koch has worked all over the world, been featured on local and international television and is a frequent guest at some of South Africa’s biggest comedy events: The Smirnoff Comedy Festival, the Vodacom Comedy Festival, King Size Comedy, The 94,7 Heavyweight Comedy Jam, Blacks Only, SA London Comedy Festival, and more. Book Comedy Ventriloquist Conrad Koch Now.